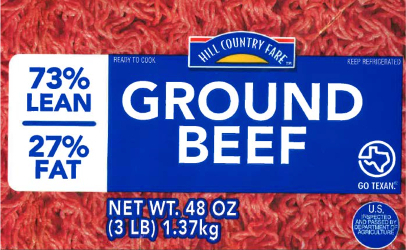 A Texas beef processor is recalling more than 30 tons of meat after a consumer reported finding a metal fragment of Hill Country Fare brand ground beef. Sam Kane Beef Processors LLC of Corpus Christi recalled the 60,350 pounds of ground beef today, reporting that all of the implicated meat was shipped to three H-E-B grocery distribution centers in Texas. Sam Kane Beef Processors LLC has recalled 3-pound, 5-pound and 10-pound chubs of ground beef because of possible contamination with metal fragments.